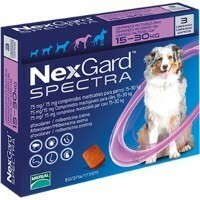 NexGard Spectra Chewable Tablets for Large Dogs are for the treatment of flea and tick infestations when prevention of heartworm disease and/or treatment of gut worms is also required in large breed dogs weighing 15-30kg. NexGard Spectra kills parasites by interfering with the way that signals are passed between the nerve cells of their nervous system, resulting in paralysis and death of the parasitic organism. Each tablet contains 75mg Afoxolaner and 15mg Milbemycin Oxime as its active ingredients.